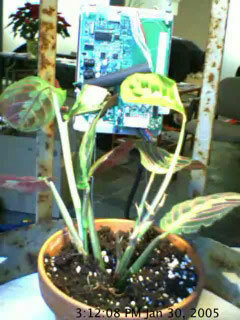 A Prayer Plant (Maranta leuconeura) in a rusty cage has its picture taken every five minutes. 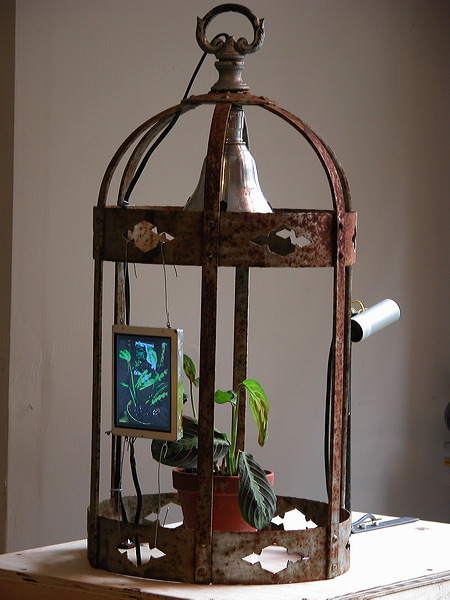 A raw LCD monitor plays a loop of the accumulated images, speeding up the slow folding and unfolding of the plant's leaves to a human timescale. An invitation to misunderstand. 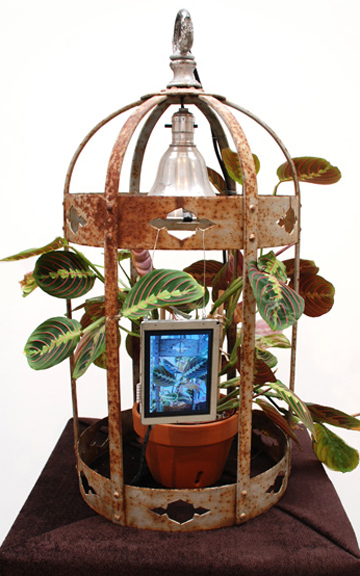 It is easy to read the plant's movement as some sort of yearning or struggle, especially given the context of the cage. I am compelled by, and wary of, the human tendency to perceive human emotions, desires, and motivations in nearly any situation. I imagine myself to be a rational, reasonable person, yet I'm constantly aware of ways in which my rational knowledge of the world and my emotional response to the world are at odds. How does one proceed in such a situation? Fly Away (Not Going Very Far) was first shown as part of the T-MINUS 2005 Timelapse Festival in New York City. It was remade for The Future Imaginary at Ben Maltz Gallery at Otis College of Art and Design in LA from January 24th - March 28th, 2009.